I decided to go into hive 1 today, the one started from a nuc this year, as last inspection it looked like they might be honey bound. They were. Although I did find a little bit of capped brood in the top deep, all available cells were quickly being filled up with nectar and there was nowhere left for the queen to lay. Since I need her to rear bees now so we’ll have bees to overwinter, I decided to free up some space. I know I said before that I wasn’t going to harvest from this hive this year, but that honey had to go somewhere! I decided to remove two deep frames that were completely full of capped honey. I also did some rearranging of the frames in the two deeps and added two fresh frames with foundation into the brood nest for them to get started on. I would have used foundationless, but so far all my deep frames have plasticell foundation, so I guess it needs to be used somehow. Here’s hoping they’ll draw it out quickly and give the queen room for more egg laying. I shook off as many bees as possible and brushed the stragglers off with a bee brush. 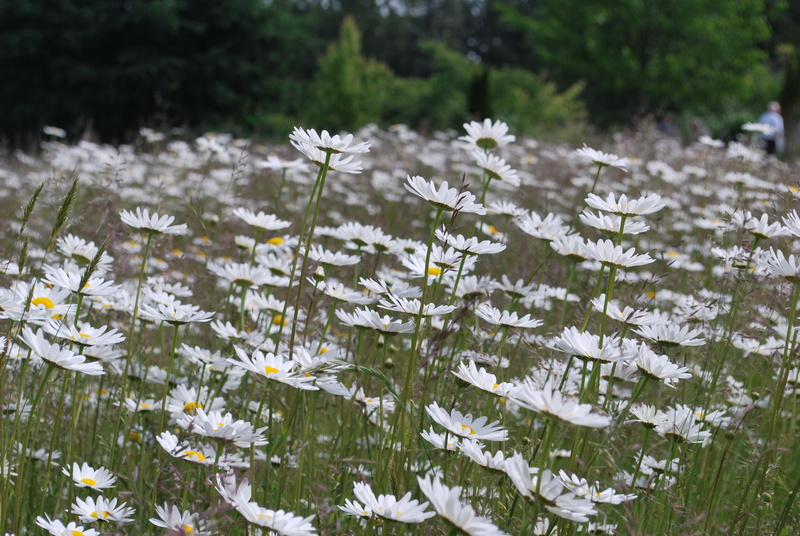 It was fairly straightforward and the bees were not too agitated. 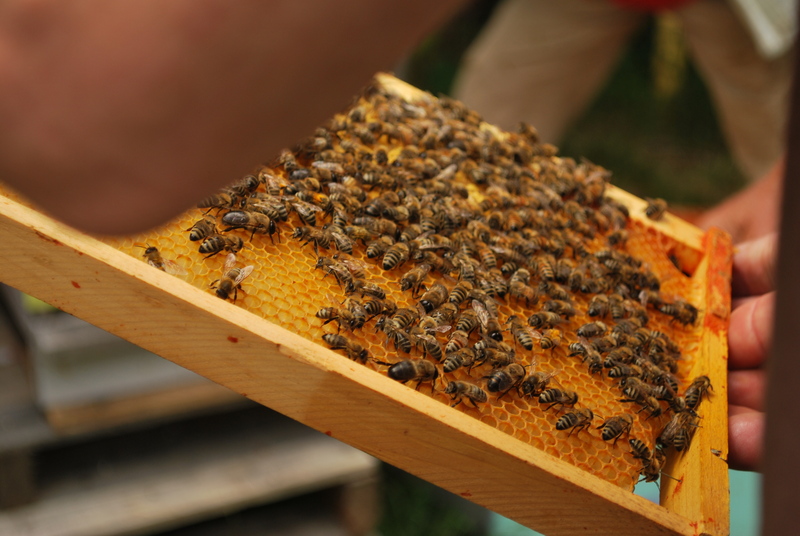 The frames weighed probably about 8-10 pounds each and I transferred them to a clean, lidded Rubbermaid bin once they were free of bees. Once inside my kitchen, I scraped off the comb into a large container with a wooden spoon, and then strained it through a stainless steel sieve into jars. It is a very dark colored honey on very yellow wax. I have to admit, I’ve never been a huge fan of honey and I don’t eat a lot of it. It always seems to have a bit of a strange aftertaste to me. The harvest from one frame is more than I generally consume in a year. Well, I’m now a fresh honey convert. This is the most delicious honey I have ever tasted! It’s tangy, floral, citrusy and light with no weird metallic aftertastes. I could see myself eating it out of the jar with a spoon and wanting to drizzle it on everything. I managed to spill a drop on the counter where it hit a stray szechuan peppercorn from an earlier recipe, and it was an amazing combination! I even drizzled some on the soft boiled eggs I had for lunch and it was divine. Apparently fresh honey goes with everything! I’m so excited to have some to bring with me to share with my family on my upcoming Seattle trip! Went to a delightful Bee Club picnic today with my fabulous boyfriend and had my first in-person look at the inside of a working beehive. There’s nothing quite like the feeling of being in the center of a buzzing cloud of bees. It shouldn’t feel safe, and yet it does. It’s an amazing calm feeling. I was also the only person to get stung today, right on the top of my head when a bee got stuck in my topknot. In a way it was a relief and there’s an aspect of it that feels almost therapeutic. I picked up some fantastic items at the fundraiser auction, some perennial broccoli starts and some seed grown, five year old trilliums. The two dozen fresh eggs I donated in a red wire basket were picked up for $10 by a charming Croatian woman who gave me a complete rundown on Linden trees, another hot auction item. Much good food, home-brewed mead and sunburns were enjoyed by all. We returned home just in time to complete a poultry trade. 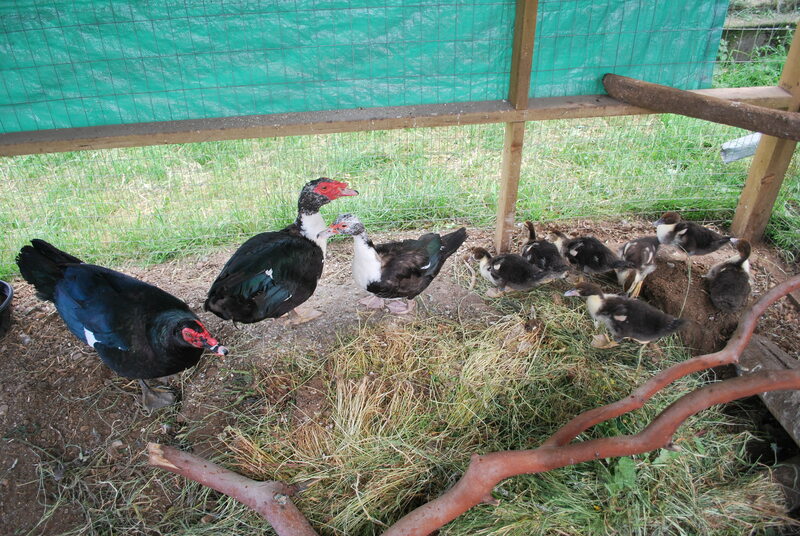 Two downtown Muscovy ducks and their seven ducklings were dropped off in exchange for one Black Copper Maran hen. Great deal! Duck social dynamics are so interesting to watch. 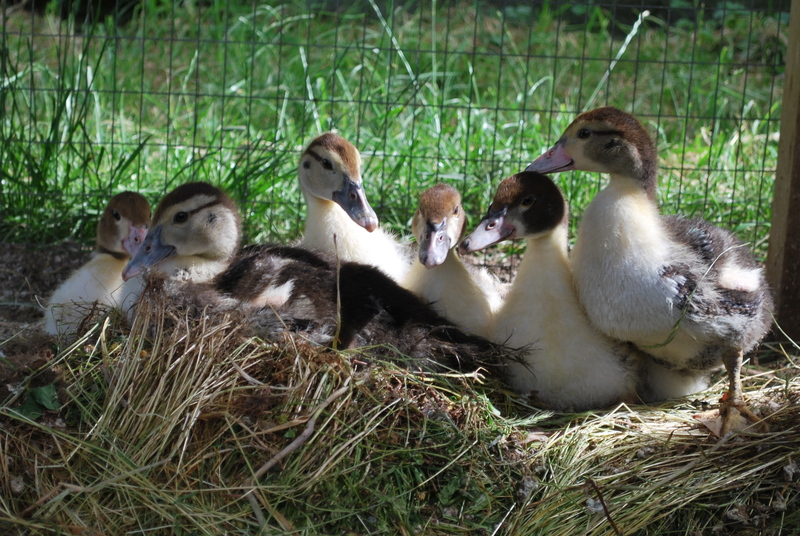 These new ducks are looking a bit ragged, but they seem very friendly and it will be lots of fun watching them grow up. I love ducks.